NIGHT EDITION - AMG PERFORMANCE EXHAUST - FULL MERCEDES BENZ SERVICE AND WARRANTY!!! 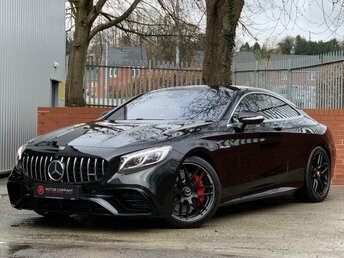 Finished In Obsidian Black Metallic Paint With Full Black AMG Nappa Leather Upholstery. This Ex-Demo Has Covered 32,000 Miles Only and Has Been Maintained Annually By Mercedes Benz Of Liverpool. 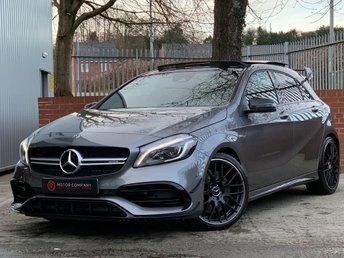 A Very Desirable Specification With Optional Extras Which Include: Interior Air Ionisation With Air Filter, Night Edition, Parking Package, Mirror Package, 21' AMG Alloy Wheels Painted Matt Harman Kardon® Logic 7® Surround-Sound System, AMG Performance Exhaust, Red Brake Callipers, Apple Car Play, AMG Performance Steering Wheel, Panoramic Sunroof, Heated and Cooling Front and Rear Seats, AirMatic Package, Dynamic LED Headlamps and Privacy Glass. Please Call or Email To Discuss, 2 owners, 5 seats, FREE NATIONWIDE DELIVERY - 5.4% APR FINANCE AVAILABLE - 12 MONTHS WARRANTY!! !